North Philadelphia's then-still developing heavyweight prospect, Jimmy Young, brought a 12-4-2 (3 KO) record all the way to Honolulu to face the more experienced and far scarier Ron Lyle of Denver, CO. Lyle was 30-1-1 going in, and boasted 21 KOs. His record showed wins over the likes of Buster Mathis, Oscar Bonavena & Jimmy Ellis. Young's record just didn't match up. Although he was a promising youngster, Jimmy had been KO'd when he stepped up in class to face crude crusher Earnie Shavers a couple of years before. Although he had avenged that loss with a recent draw over Shavers, Young seemed to be heading for another thumping at the hands of Ron Lyle. But Young showed just what a slick and gifted boxer he was, by surprising his well-seasoned opponent - and the rest of the boxing community. Young took the 10-round decision and moved onto a world title challenge against Muhammad Ali a year later. 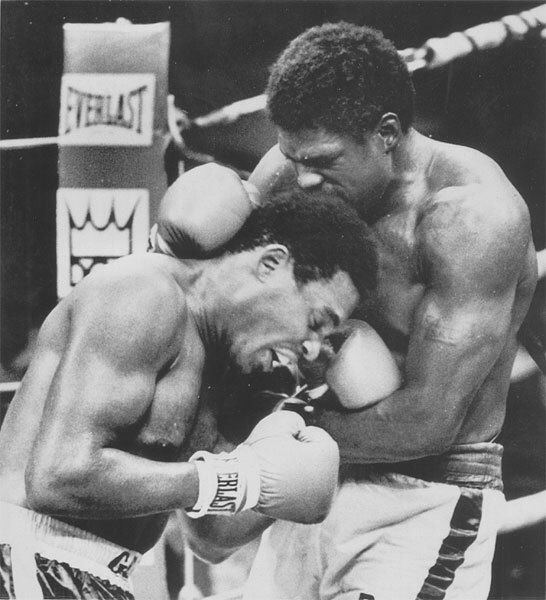 In 1976, Young and Lyle would fight again (pictured), with Young winning another decision, this time in 12 rounds.